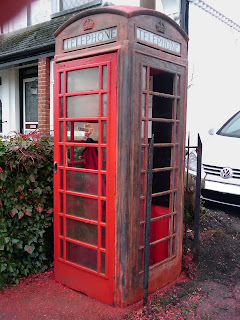 This blog documents the preservation of the Brookwood Phone Box. 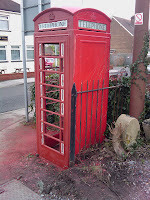 The kiosk was decommissioned by British Telecom in early 2009, and acquired by the local council to be preserved for the village. 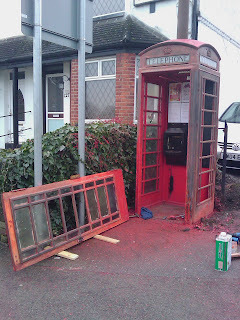 A small team of villagers set about restoring the phone box, and then preserving it for future generations. 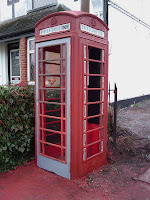 You may contact the author at contact@brookwood-expo.org.uk if you would like advice on restoring your kiosk. Windy and cold today. I had aimed to finish off the inside of the door today, but it was essential that I at least primed the mahogany door surround inside as the weather looks poor for the weekend. I'm off camping with the Explorer Scouts, so it is unlikely anything would get done directly on the kiosk over the weekend. With there being no glass, and the rain generally coming from a westerly direction, the inside of the door gets a right soaking when it rains. I did achieve that, but it was not without drama. Still on target for a mid May completion. I continued to scrape the paint from inside the kiosk today (as it is still raining), and we will be in a position to prime this at the weekend if the weather is kind. I had a chat with Mrs Green at Brookwood Primary School today about how the school could become involved with the kiosk. I'm really pleased with the outcome; the School Council will be tasked with designing a collage / pictures to be displayed in the kiosk for the time we officially finish it. After this, an idea discussed was that each class would design something on a rotational basis to be displayed for a month at a time. I am really grateful to Mrs Green for helping here, as the school and young people are central to the Brookwood community. Finally, David Spencer (Knaphill resident and kiosk supporter), has suggested we make the kiosk a cache for geocachers to find. For those totally confused at this point, head to this web site: http://www.geocaching.com/ In a sentence, geocaching is where a cache is set, and geocachers 'hunt' for the cache using hand held GPS systems to find it. It is a worldwide activity with several million geocachers hunting for nearly a million caches around the globe. We'll develop this idea, as a cache formed around the kiosk will be quite original. There are already caches in Pirbright, Knaphill and along the Basingstoke Canal. 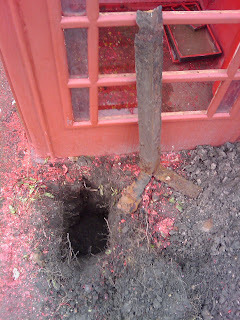 Fresh from my trip to Scotland touring Scottish Telephone Boxes (only kidding), I got stuck in to removing the damaged post left by the vandals a couple of weeks ago. I was concerned that if someone fell on it, it had the potential to cause a serious injury which would mean 'elf & safety would crawl round the kiosk for evermore. We initially thought the posts were concreted in, as they were solid. However there was a miniscule amount of movement to the post when forced, which gave us the impression they may not be. Having dug a pit this morning, I can confirm that they are not concreted in. Approximately 18 inches down the post has a couple of six inch feet extending out at 90 degrees. I've not seen this before, and can only assume that when things were done properly many years ago, an engineering solution was used rather than just encasing something in concrete. It does raise the question of whether we should go to elaborate lengths to put the posts back in the same way or whether we just bung concrete round them. I'll bottom this one out with Alan later. It would be nice to complete the job in the most original way, but if it is buried 18 inches below the ground, and the only people who will ever know are those that dig the posts up in 50 years time, is it worth it? The attached picture shows the post, but frustratingly doesn't really show the size or depth of the hole very well (it was hard work and I worked up a sweat getting that out). Today I also decided to remove some of the ivy from the wall round by the third side (we have sought permission from the house owner). I would have scraped some of the paint off that third side, but it started raining so I worked inside instead. I decided to scrape the paint from the door with a view to priming the inside of the door this coming weekend. When the weather improves, I'll try to get that third side done. Ben Huddart, a local plumber and a member of Brookwood Social Club has agreed to sponsor maintenance of the kiosk by displaying a poster advertising his services. This is now inside the kiosk. There remains one space left if I remember correctly with Allsigns, Baker's Dozen, Ben Huddart, Brookwood Social Club, Fulk Bros & Glassmaster all agreeing to display posters inside the kiosk. I bumped into Kath Brooks (who is a keen supporter of the kiosk), and we were discussing the railings and the patch of dirt where the railings were placed. We are looking at options for that tiny patch of land. I was initially thinking of concreting it over when we put the railings back. Kath was suggesting that perhaps a small flower bed could be laid. We'll bat ideas around over the next few weeks and try to come up with something the village supports. If you have a view, please let me know. I have been thinking for a while about how to prevent vandalism, and it occurred to me that getting young people involved with the kiosk may be the way. If they are involved somehow, then perhaps they would develop some respect for the kiosk and not smash the windows in years to come. Maybe this is a bit of an idealistic view and totally out of touch with reality. However having spoken with Glynis Preshaw this morning, we are going to contact Mrs Green at Brookwood School and see if the school would like to get involved somehow. Glynis and I thought that maybe some art work produced by the pupils could be displayed on a rotational basis. We'll run with the idea and see what happens. 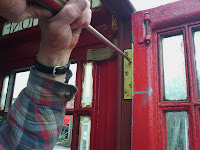 With a break in the weather, we have now completed priming the door with red oxide. Additionally, we have done a second coat of wood primer to the mahogany door surround. This was required partly because some Nitromors dripped on the wood we had already primed when I completed stripping the door on Friday. Stripped the paint from a couple of the small cast iron glazing frames. The kiosk is looking good now. 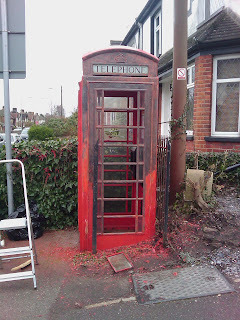 To get the two sides primed, and with all the other bits and bobs going on behind the scenes, we have put in around 36 hours labour so far. The kiosk is now secure - ish. It's still possible to throw litter in and pee in the kiosk, but now that can only be done so through the missing windows as the door has been locked shut. I'd publish pictures, but it will only compromise security. Suffice to say Unicorn's advice coupled with our own ideas has provided us with a workable solution. The rain hampered our chances today of finishing off the red oxide priming of the door, however I did clear pretty much the remaining paint on the door, so we'll prime it once the weather allows. Our target for this coming week, is to complete priming the door, make a complete set of eight large glazing frames, and remove the paint from the additional small glazing frames which Unicorn gave us. It's jolly cold this morning. Scraping paint during snow flurries doesn't appear to be sensible to me! Almost scraped off the remaining paint from the door side, will probably take about half an hour to finish it off. I'll probably complete this on Friday, and then red oxide that side immediately to protect it. That will then be two sides with an initial coat of primer. I'll then start work on the third side with windows - this will be quite a challenge due to the proximity of the wall and the ivy. I expect to complete that side by the end of February. Spoke with PCSO Naz about the small bit of vandalism the kiosk suffered last weekend. I need to file it as an official crime, which I'll do this afternoon. Continued to scrape paint from the inside, it is much easier than the outside (and slightly warmer), as there appears to be fewer layers. One coat of Nitromors seems to be enough to get to bare metal in the couple of places I've tried so far. It was never part of the plan to complete the inside ahead of our May deadline, but you never know, it may be possible, we'll see. Fulk Bros the Brookwood butcher and Baker's Dozen the Brookwood bakers will be sponsoring the maintenance of the kiosk annually by displaying a poster inside the kiosk. We are lucky in Brookwood that we have the best butcher and the best bakers in Surrey (so it will say on the posters), and it is fantastic that both businesses are happy to be involved in the kiosk restoration and preservation. Their posters mean that there are two remaining advertising spaces left to fill. The kiosk restoration had a mention this month in the Brookwood News news letter and a link to this very blog. I think a more substantial article will be produced in a future news letter when Mike and I get the time to discuss it. We start with the most unfortunate news that we suffered a small vandal attack Friday night. The local Village Idiot and his or her friends decided to remove the post that had rotted through. Unwittingly, they did us a favour, as our hand has now been forced and we'll have to do a proper job and redo the posts and railings. What we could not have done with, is the post then being used to damage a residents car; I shall report this to PCSO Naz on Monday. The intention now with the railings will be to totally remove them, make new posts and then eventually put the posts and railings back. Our plan today was to remove the door so that we could strip the hard to reach sections of paint around the door frame. 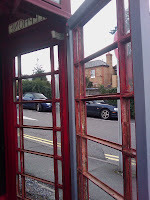 We also wanted to complete stripping the paint from the two sides we had started, and red oxide them for protection. The attached picture shows the kiosk with the door removed, this was easier than we expected, and only one screw caused us any problems. We then worked on removing as much paint as possible, but decided early on that we wouldn't quite finish the door side, so we decided to ensure we had protected the wood with decent exterior wood primer, and red oxide as much as possible. I also wanted to know how well the four Telephone signs in the top of the kiosk could be expected to clean up. So, some time was spent working on one of those. We needed to do this, as these are puttied in, and we really didn't want to replace them unless absolutely necessary. These will clean up fine thankfully. After several hours, we had primed the wood on the door, and painted the red oxide on most of the exposed metal. Finally we rehung the door. For this we used new hinges purchased from Unicorn, as the old ones had perished and had caused the door to slip, and jam when being closed. The attached picture shows Alan putting in the last of the screws. Again, this was easier than expected, with only a little bit of jostling with the door to get it in place. We will remove the masking tape today before it gums up to the point where we can't remove it. This week, we intend on finishing priming the door side, and fitting the locking mechanism. I wish I was a shoe maker rather than a freelance IT consultant, as it would be nice to wander down to the kiosk and discover the elves had finished the job. Turned a corner today, a good four hours spent this morning. 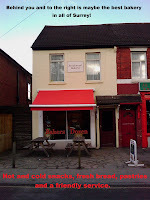 As you can see from the attached picture, a great deal of the door side (North facing) has been cleared of paint. What you can't see is that some of the paint on the inside has been scraped off too. Again, the crown is the fiddly bit, and there's still some more paint to get off it. 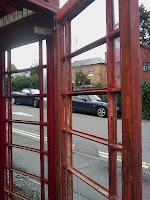 I've left the actual door for two reasons: a) it is easier to scrape paint off without glass in, and b) although the kiosk is cast iron, the door surround is actually hard wood. As the wood is donkey's years old, I want to scrape the paint off and then prime it the next day. I need to discuss with Alan whether we are able to do some protective work this weekend, which of course, also depends on the weather. Other developments; dedicated insurance is a no no, as the minimum premium cost on most policies is about £250 per annum. I'm going to see if there is any possibility of adding it to Woking Borough Council's general insurance policy (WBC does own the kiosk afterall). It may automatically be covered for all I know. I was talking with PCSO Naz yesterday about security of the kiosk. Although crime in Brookwood is fairly low, the kiosk will probably make a nice target for some people to have some fun with. I'm not talking about someone painting it pink with yellow spots overnight, but popping some of the glass etc. We thought that perhaps a dedicated CCTV camera pointing at the kiosk would at the very least give us a chance of catching any undesirables. Coincidentally, Brookwood Social Club is directly across the road, and as I'm a member, I'll have a chat with the committee and see if there is anything they can do to help us. An intensive couple of hours spent yesterday and a couple of hours today have yielded a nice looking crown with plenty of detail. I've asked Allsigns to gild all four crowns although I have no idea what the cost of that would be. Gold crowns were never originally on the kiosks, but is a modern process started by Unicorn Kiosk Restorations and it tends to signify a restored kiosk. It really will stand out, and along with unpainted brass hinges and a polished door handle will make the restored kiosk look stunning. The Brookwood kiosk has a King George crown which would show it has probably been in the village in excess of 60 years. 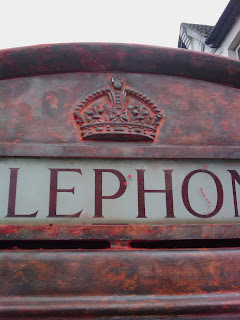 Judging by the layers of paint I'm having to scrape off, I reckon BT painted it once every ten years or so! Another couple of hours work this week and this west facing side will be clear of paint, we'll then red oxide it. Other exciting developments in the world of kiosk restoration; Allsigns have completed the film for the preservation notice which will cover one of the panes. Having seen the finished pane, it is absolutely amazing and has a real professional edge. I did take a photo of it, but the pictures don't do it justice, so I decided not to publish it. Started to discuss with our Councillor (Glynis Preshaw) about the official ceremony to mark the completion of the kiosk and the publicity it may generate. Once this is set in stone, we'll have to ensure we complete it in time, which stops the project taking several years. Finally, I’m looking in to the option of insurance for the kiosk, not from day to day, broken pane type issues, but from a total loss. I know it has been there for years without mishap, but there is always the risk that a lorry crashes into it and totally destroys it. We'll see what happens on this one.